We all love our hair, don’t we? Well, hair is certainly one of the important aspects of beauty both for a man and a woman, so it is obvious that having voluminous hair is a matter of pride and happiness. But, simply having thick long hair will not do, the quality of the hair matters as well. The reason I am saying is because I have seen people having long hair, but full of dandruff that makes the hair look really ugly. Apart from being embarrassing, dandruff can cause other hair issue, if not treated early on. And today I am going to discuss about dandruff; from cause and symptoms to how to treat dandruff naturally and easily at home. I have had dandruff issues in the past and I have dealt with it successfully using all natural ingredients and that too at home. If you are facing dandruff issues, and is determined to get rid of it the natural way, then this is a must read post for you. Today I am sharing everything worth knowing about how to treat dandruff naturally at home. I am sure that these hair care hacks will help you treat dandruff and offer fast relief from dandruff issues, if implemented the right way. In fact, dandruff simply hampers the overall look and is also a matter of huge embarrassment. Now, there are no second thoughts that dandruff is damn irritating and so the faster it is dealt with, the better for you. Well, there are various shampoos available in market which promises very quick results in treating dandruff, but most of these products contain harmful chemicals which may ruin your hair and cause other hair issues. Hence, I always prefer going the natural way using ingredients that are safe and are good for our hair. Dandruff is a kind of hair issue that can increase several other hair problems including rough hair and hair fall. So, it must be dealt immediately. Before going to the remedies, knowing about the most common causes of dandruff will be of great help. When we are aware of the possible causes that may lead to dandruff, we’ll be able to deal with it much efficiently. This will help you treat dandruff from the roots and thus, the benefits will be permanent. Well, now you know that there are many factors that can lead to occurrence of dandruff. So, the first thing is to identify which of the above factors have caused the dandruff. 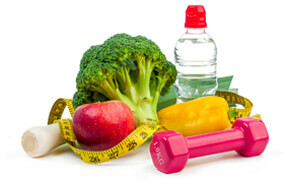 If it is something that includes lifestyle changes, then you must try to change it for you own betterment. But if it is due to any disease which is not in your hand, then consult a good doctor and get proper cure of the illness. In the meantime, continue using the natural remedies that will give you added benefit in solving the dandruff issue. The natural remedies are safe to be used by most of us and, so without further delaying, let us start with the easy and effective tips on how to treat dandruff naturally at home. Those who have the problem of dandruff knows how irritating and embarrassing it is to even visualize dandruff all over your scalp and hair. Dandruff falling on your shirt or top can ruin your look and personality. It is equally disgusting for people around you. Hence, measures must be taken to treat dandruff and I wil help you do that easily at home. Listed below are the best hair care tips to treat dandruff naturally at home. If you are tired of dandruff and want to treat it then take a note of following tips. Talking about natural remedies to treat dandruff, I personally prefer the usage of ingredients like coconut oil and lemon. Coconut oil has healthy fatty acids like capric acid and lauric acid present in it which makes it a perfect antimicrobial agent, very efficient in fighting the bacteria, fungus or virus which causes skin conditions eczema and psoriasis. In fact, studies have shown virgin coconut oil to be very effective against atopic dermatitis (eczema). So, if these skin conditions are treated properly, then the problem of dandruff will also be gone permanently. Besides, coconut oil is also the perfect nourisher and moisturizer and so your hair will get all the nourishment it requires to get rid of the xerosis or dryness and regain its lost luster. However, for maximum benefits, I recommend the mixing of lemon juice as it is equally efficient in helping you get rid of the dandruff. 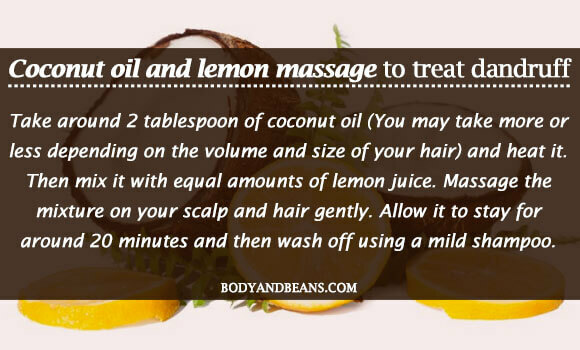 Moreover, if you mix the coconut oil and lemon, then your hair and scalp will neither turn too oily nor too dry. So, it is just perfect for treating dandruff. Take around 2 tablespoon of coconut oil (You may take more or less depending on the volume and size of your hair) and heat it. Then mix it with equal amounts of lemon juice. Massage the mixture on your scalp and hair gently. Allow it to stay for around 20 minutes and then wash off using a mild shampoo. Using this remedy 2-3 times weekly will give you beneficial outcome. 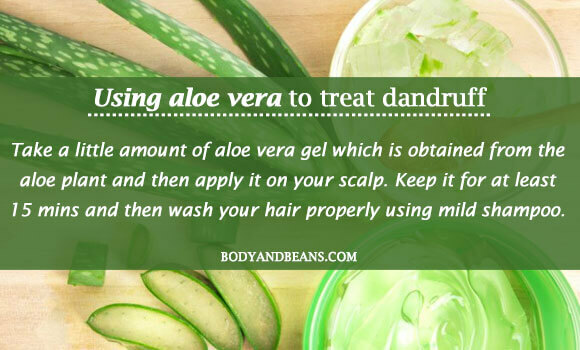 Aloe vera is one of the most popular ingredients as far as natural remedies to treat many skin and hair issue, and the dandruff issue is no exception. The main reason is that aloe vera has a very soothing effect on the skin and is considered safe for most skin types. And, as per a review report, the antimicrobial nature of it can help to protect your hair against the occurrence of dandruff. Aloe vera also has proteolytic enzyme characteristics which give the capability to it to break down proteins, including the dead skin cells. This particular property of aloe vera helps it to work as an exfoliant and removes the dead skin cells so that they do not appear later in the form of dandruff. In addition, it can also fight fungus and treat several fungus infections leading to hair loss. So, aloe vera is needed for good and healthy hair in general as well. Take a little amount of aloe vera gel which is obtained from the aloe plant and then apply it on your scalp. Keep it for at least 15 minutes and then wash your hair properly using mild shampoo. For best results, you can do it on a regular basis. One of the other tips on how to treat dandruff naturally at home will be to use neem leaves. Well, as per a study published in “E-International Scientific Research Journal”, neem is the perfect antifungal agent that can be excellent in treating dandruff. It is also antibacterial and possesses anti-inflammatory properties which further aids in getting the benefits. 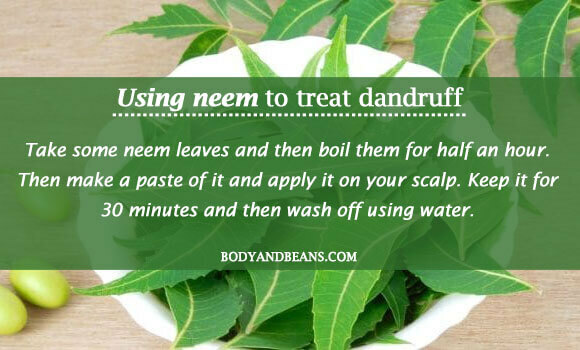 So, you must definitely give neem a try to get rid of your dandruff issues. There are two very beneficial methods of using neem for your hair. In one of them, you will have to take some neem leaves and then boil them for half an hour. Then make a paste of it and apply it on your scalp. Keep it for 30 minutes and then wash off using water. In the other method, you need to take some neem leaves and then crush them to make a powder. Then take a bowl and pour the powder in it. Mix some olive oil along with it. After that, apply the paste on your scalp and keep it for almost an hour before washing it off. Apply some mild conditioner after you shampoo your hair. Once you apply neem paste on your scalp, it may itch a little but you do not need to worry much as this sensation is absolutely normal. 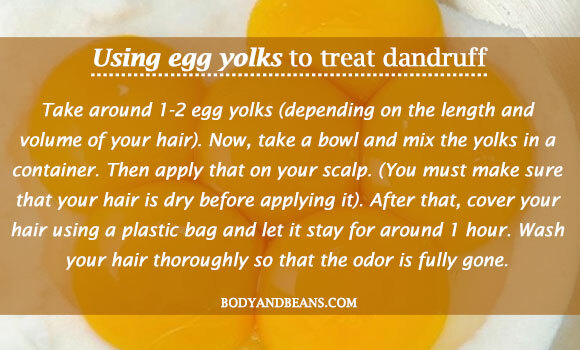 You can also use egg yolks to treat your dandruff issues easily at home. The primary reason behind it is the presence of biotin in it which is a vitamin, very efficient in treating dandruff. And, biotin is equally good in preventing hair loss which is otherwise a very common consequence of having too much dandruff. Take around 1-2 egg yolks (depending on the length and volume of your hair). Now, take a bowl and mix the yolks in a container. Then apply that on your scalp. (You must make sure that your hair is dry before applying it). After that, cover your hair using a plastic bag and let it stay for around 1 hour. Wash your hair thoroughly so that the odor is fully gone. It is best if you do it two-three times weekly in the morning while you go for a bath. 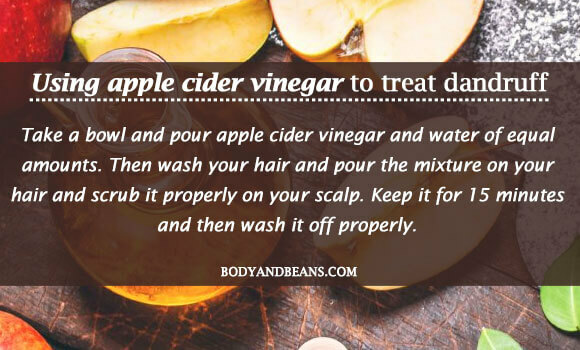 Many a times, it is the yeast which causes the dandruff on your hair and if it is your case, then apple cider vinegar remedy is the best solution for you. The reason for this is the mild acidic nature of ACV which leads to the change in the pH levels of your scalp which in turn hampers the growth of the yeast. Take a bowl and pour apple cider vinegar and water of equal amounts. Then wash your hair and pour the mixture on your hair and scrub it properly on your scalp. Keep it for 15 minutes and then wash it off properly. You may repeat the remedy on a daily basis at least for a week for significant improvements. However, you have to be careful that the mixture must not enter your eyes. Also, if you have any scab or any unhealed scratch, then that might get burned once you apply it. So, in case, it happens, make sure you wash the affected area with water thoroughly. 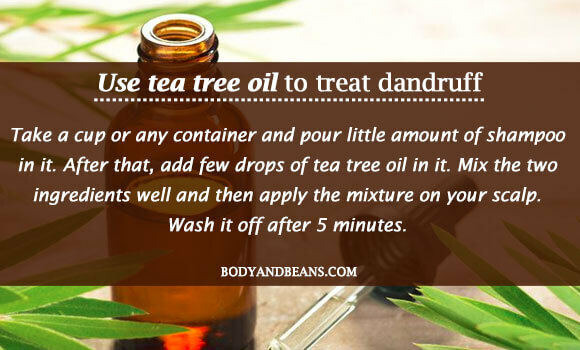 Another efficient way to treat dandruff naturally at home is by using tea tree essential oil. It is an excellent anti-inflammatory agent and has a higher of dermal penetration, which makes it excellent in treating dandruff. Tea tree essential oil has its origination from an Australian tree and it is famous for antifungal characteristics which is also very much favorable for treating dandruff. In fact, in one of the studies, it was seen that participants who used around 5% tea tree oil shampoo for around a month experienced a 41% reduction of their dandruff whereas those who used shampoo alone had only 11% reduction. Tea tree oil is also a perfect antiseptic and is good in treating all kinds of infections. Take a cup or any container and pour little amount of shampoo in it. After that, add few drops of tea tree oil in it. Mix the two ingredients well and then apply the mixture on your scalp. Wash it off after 5 minutes. If you repeat it on a regular basis for even a week, you will enjoy fast results. Our bodies may contain yeast which can trigger inflammation and can result to yeast on our skin. In such a situation, our body requires the help of friendly bacteria to fight back and reduce the yeast within our bodies and that is where the importance of using yogurt lies. Yogurt is probiotic in nature and is the ideal source of friendly bacteria which helps prevent the scaling of our scalp. 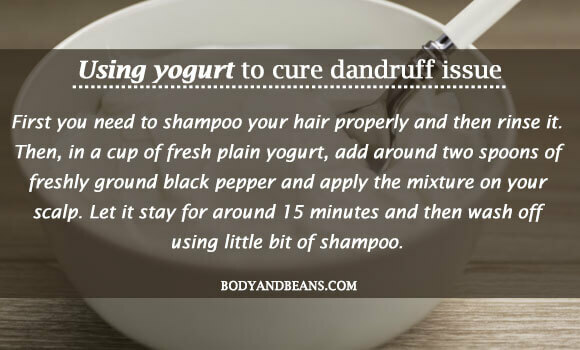 You may also add a little bit of ground black pepper along with yogurt as well as it has anti-fungal properties good enough to eliminate dandruff issues. First you need to shampoo your hair properly and then rinse it. Then, in a cup of fresh plain yogurt, add around two spoons of freshly ground black pepper and apply the mixture on your scalp. Let it stay for around 15 minutes and then wash off using little bit of shampoo. This is a great remedy and you can try it out in the morning when you take your bath. Fuller’s Earth or Multani Mitti is another popular ingredient and you can surely use it to treat your dandruff issues. 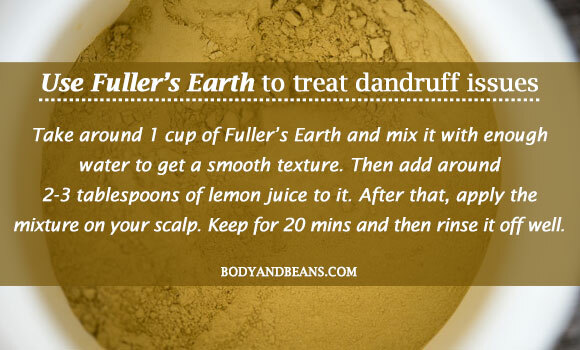 The main reason why it is recommended is because Fuller’s Earth absorbs all the dirt, oil and grease from your hair and scalp which are otherwise the leading causes of dandruff. It also leads to proper circulation of your blood to your scalp which further helps in keeping your scalp clean and free of dandruffs. Besides, using Multani Mitti, you can also add a bit of lemon juice to this remedy in order to intensify the good effects. Take around 1 cup of Fuller’s Earth and mix it with enough water to get a smooth texture. Then add around 2-3 tablespoons of lemon juice to it. After that, apply the mixture on your scalp. Keep for 20 minutes and then rinse it off well. Applying this remedy 2 times a week will be highly beneficial in treating dandruff. Next time you eat orange, think twice before throwing away the peel. 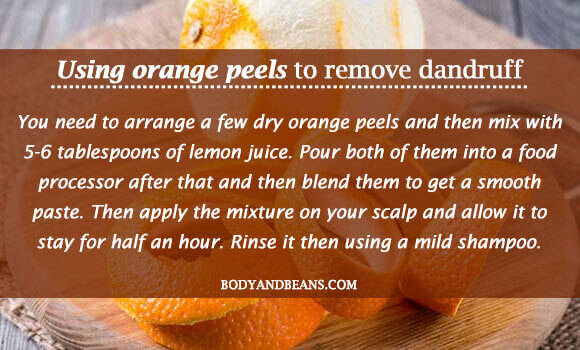 This is because orange peels are a great remedy to treat your dandruff issue. Orange peels have acidic characteristics which condition your hair and reduce the excess oil from your hair. This, in turn, prevents the occurrence of dandruff problems. Orange peel in itself is very efficient but when it is used along with little lemon juice, the results are all the more fascinating. You need to arrange a few dry orange peels and then mix with 5-6 tablespoons of lemon juice. Pour both of them into a food processor after that and then blend them to get a smooth paste. Then apply the mixture on your scalp and allow it to stay for half an hour. Rinse it then using a mild shampoo. This is one of the best tips on how to treat dandruff naturally at home and you can repeat this remedy 2-3 times in a week for best results. The last tip that I will give you on how to treat dandruff naturally at home is by using the fenugreek seeds or methi seeds. It is an ideal remedy for you to try, thanks to the presence of the healthy vitamins and minerals in them. 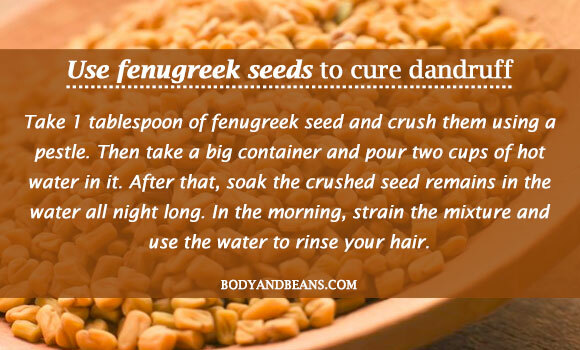 In fact, “Research Journal of Pharmaceutical, Biological and Chemical Sciences” have stated that one of the benefits of fenugreek seeds is to remove dandruff from hair. Take 1 tablespoon of fenugreek seed and crush them using a pestle. Then take a big container and pour two cups of hot water in it. After that, soak the crushed seed remains in the water all night long. In the morning, strain the mixture and use the water to rinse your hair. This is a great remedy and you can use it every day before you go to take bath in the morning. Well, most of the issues occur from drinking less water and the problem of dandruff is no exception. Dehydration in your body will lead to excessive dryness in your skin and scalp which will automatically lead to dandruff. 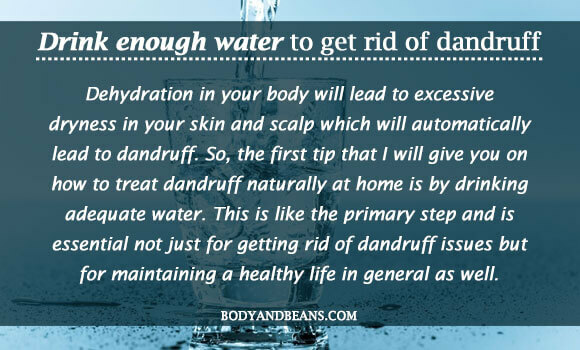 So, the first tip that I will give you on how to treat dandruff naturally at home is by drinking adequate water. This is like the primary step and is essential not just for getting rid of dandruff issues but for maintaining a healthy life in general as well. I understand that living in a competitive world is never easy. Most of us face stressful situations almost every day and so it is hard to keep ourselves calm and relaxed. But, if you have to keep yourself healthy, then you have to try to do so. Apart from the health complications, several skin and hair issues occur from excessive anxiety, stress and depression with dandruff being the most prominent example. So, I would request you to try out stress reduction techniques to help yourself. 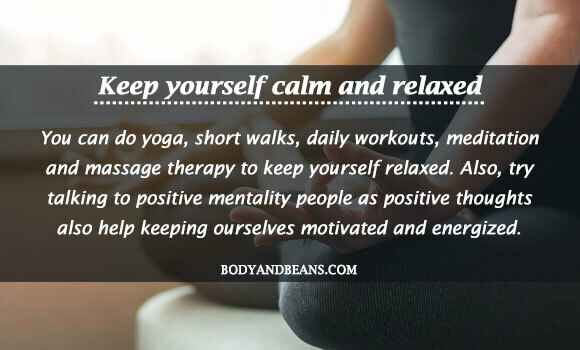 You can do yoga, short walks, daily workouts, meditation and massage therapy to keep yourself relaxed. Also, try talking to positive mentality people as positive thoughts also help keeping ourselves motivated and energized. The problem of dandruff is really frustrating not just for the people around but even more, for the person who is affected by it. It will fall on your dress and make you look really clumsy and dirty which can put you into huge public embarrassment. There are several causes behind its occurrence, most of which I have already discussed today. It is very important for you to know the cause in your case that has led to the dandruff. Once you know the cause, you will be able uproot the problem from its roots. Solving the problem withoutknowing the cause may bring back the problem after a few days. Today, I have given you enough tips on how to treat dandruff naturally at home as natural ways are the best. They are safe, cost effective and do not take much efforts. However, you also need to eat properly and in this case more of omega 3 fats and probiotics diet is required for the quick benefits. Ideally, ingredients that we have discussed here can help you treat dandruff if you follow the instructions properly. But if in your case, the problem still persists then you should consult a doctor. So, are you bothered with dandruff in your hair? Then it is high time to try some of these remedies and treat dandruff naturally. However, do share with me your valuable feedbacks and also do not hesitate to give some advice or share suggestions or may be tell us some other ways on how do you treat dandruff problem at home? Until then, stay beautiful and do not let the dandruff mess up your whole look.